I made a terrible mistake with this bento. I was supposed to make a panda but instead of using white egg omelet layer, I replaced it with cheese ... and what happened can you guess?? The panda was not white-black panda but yellow-black panda hahaha ... :o) I used twin boxes for the bento. The pink one filled with the onigiri yellow-black panda. And the blue one filled with some veggies (flower carrots, corns, purple cabbages, cherry tomatoes, snow peas) and meats (chicken nuggets, flower ham). After posting this bento, I will meet some friends at Starbucks and have a little chit chat there. And after picking up the kids from the school, I will have to go to take some twilight photos with the other group of friends. Busy day ... have to run now. 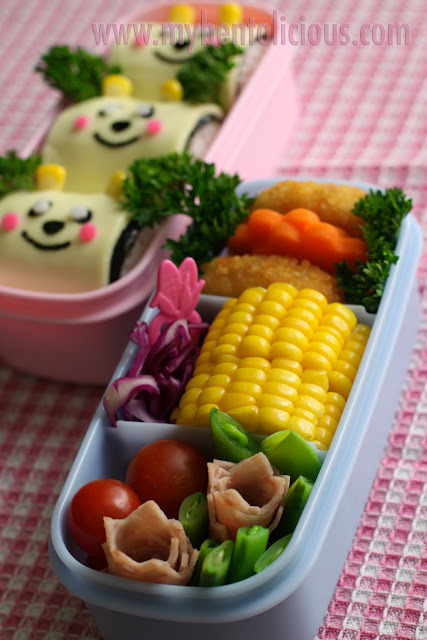 What a great bento and I love the pandas! Your photography is wonderful. What kind of camera do you use? yellow or white, it is still super cute! You are very professional in bento works!! @niger1437 : thanks a lot, you are great too!! 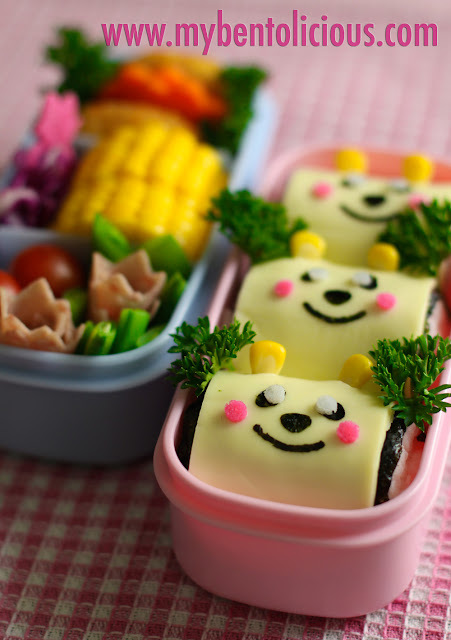 Hi..Susan..salam kenal juga, suka liat koleksi bento nya sangat bermanfaat buat aku yang punya balita nih..
Hey..wow this one makes me hungry...Goooood Joooob!! Hey, have you ever had masak bareng event? I think this month theme is bento. Wait a minute. Apparently, it's November in Indonesia already. Sorry.